AccessLex Institute offers this Legal Education Data Deck for the use of the legal education community, policymakers, and others interested in viewing a snapshot of certain data and trends organized around the three driving principles of our research priorities: access, affordability, and value. AccessLex Institute® offers this Legal Education Data Deck for the use of the legal education community, policymakers, and others interested in viewing a snapshot of certain data and trends organized around the three driving principles of AccessLex Institute’s research agenda: access, affordability and value. This is a living document that will be updated periodically—AccessLex Institute welcomes comments, criticisms and suggestions so that this document will be a useful tool to those whom we serve. 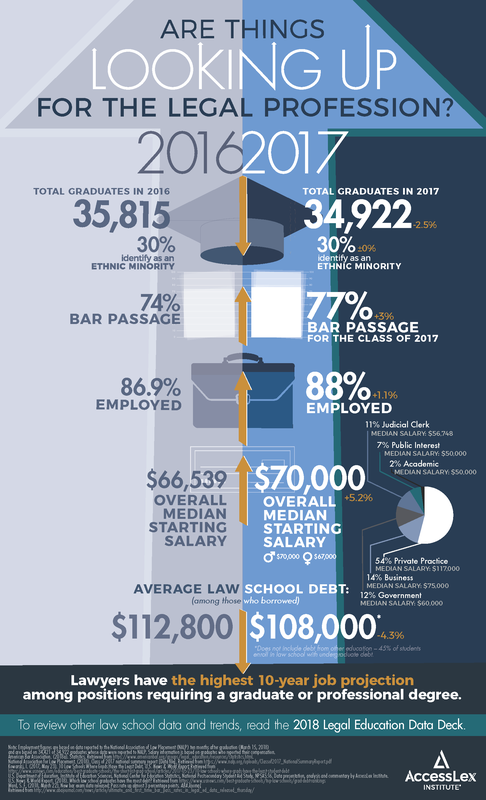 In compiling this data deck, we have utilized publicly available datasets from third parties, including but not limited to the Law School Admission Council, the National Conference of Bar Examiners, the National Association for Law Placement and the American Bar Association Section of Legal Education and Admissions to the Bar. We thank these and other organizations for making such data available. AccessLex Institute uses these data as the basis for the presentation, analysis and commentary contained herein, and takes sole responsibility for the quality and accuracy of such presentation, analysis and commentary.